as a member of the DLANC Complete Streets Working Group - Daveed worked with Landscape Architect Tony Lopez, Berry and Linné, Lyric Design and Planning, and Hensel Phelps Construction Company to convert 4 parking spaces on Spring Street between 6th and 7th into two mini public plazas. 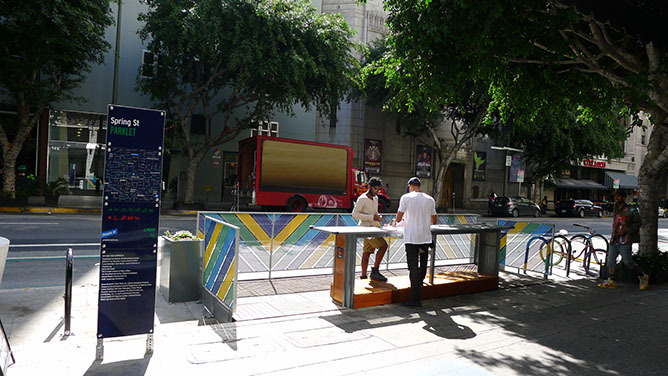 these 'parklets' enhance the visibility of people on the street, making drivers more aware of their surroundings, increasing safety on a street with one of the highest rates of vehicle-on-pedestrian collisions in the USA. Perimeter treatment is steell frame with inset folded perforated steel chevron pattern. 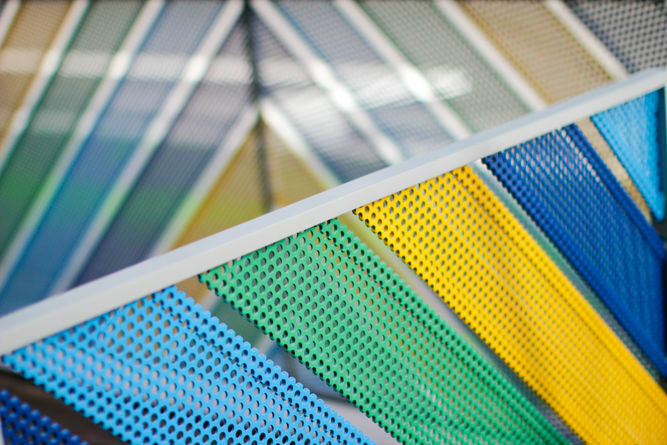 the infill perforated steel panels are painted in an alternating pattern of bright safety colors to increase visibility of the parklets. fabricated and donated by beck steel. 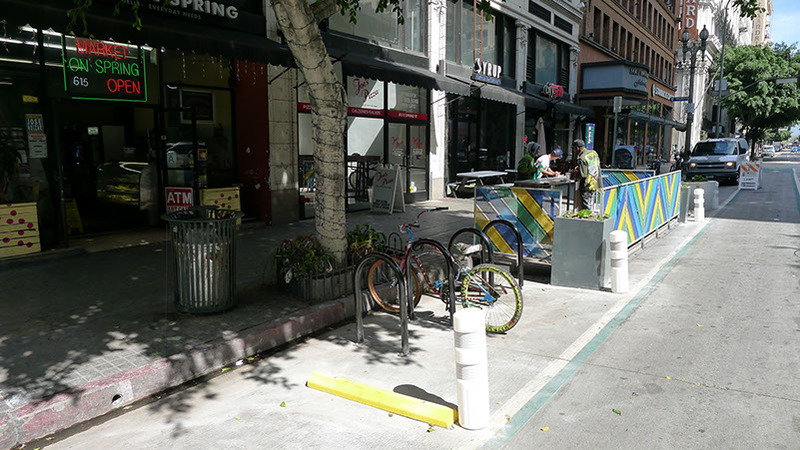 both parklets feature 'ponto' round planters from old town fiberglass that protect the end facing oncoming traffic. insides of decks are lined with redwood planters from jj roberts and son. low height plantings were required to maintain visibility into the parklet. all landscaping is climate appropriate and drought tolerant. the 'communal' parklet to the north has a high counter/planter surrounded by high stools and standing space. galvanized top supported by steel frame with redwood infill. the 'active' parklet to the south has a foosball table, custom turf pavers mixed with stepstone concrete pavers, and sunbrella cushioned benches on redwood bases. eight custom seats suspended in metal frames were designed by the complete streets working group and fabricated by paramount roll and forming. these 'swing seats' encourage play, movement and interaction. deck is supported along sidewalk edge by steel ledgers bolted to the concrete curb so as not to impede gutter drainage. remainder of the deck is supported by grid of bison adjustable pedestals and shimmed to create a level deck. the steel frames of the guardrails are anchored to the existing concrete roadbed. 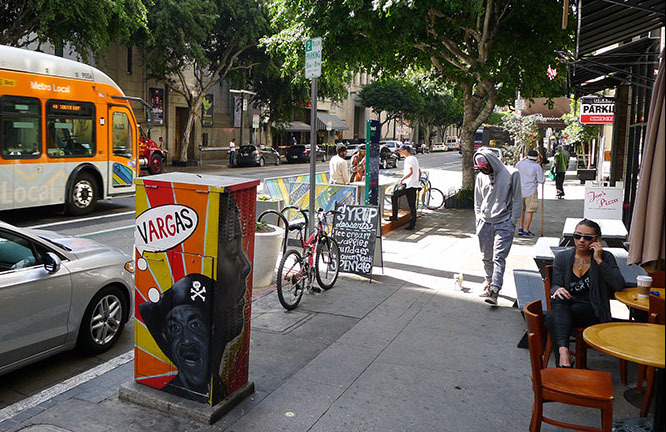 the parklets serve as stormwater filtration: the perforated grating used as the base perimeter enclosure prevents trash from entering storm drains and flowing out to our waterways and ocean.